Delicious fresh New Zealand cherries make the perfect Christmas gift for clients, staff or family. Delight your clients with a memorable gift that will stand out from anything else they receive. 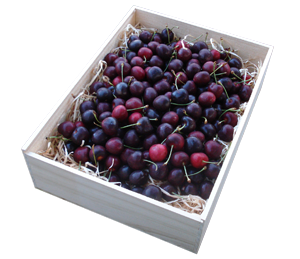 Our export quality cherries are all grown in the South Island and are presented in an attractive wooden gift box. We can brand these boxes with your logo or message to make them a very personal gift*. Delivery: Between the 4th and 18th of December 2018. All boxes will be delivered directly to your recipients. Delivery nationwide can be arranged. Pricing - $75 + gst ( including delivery ) for 2kg of export quality fresh cherries packed in a wooden gift box. *Please note that a small charge for the artwork set up may apply for orders under 50 boxes.